Montmorillonite, Glutamine, Mannan Oligosaccharide, Methyl Paraben, Propyl Paraben, Enterococcus Faecium M74 (NCIMB 11181). If your pet is vomiting, then 12 -24 hours without food will help. After that you should offer bland, easily digested food (fresh cooked chicken or white fish is best, with a little rice for dogs). Ideally the food should be offered in several small snacks through the day. The total amount of food offered should also be reduced. Plenty of fresh water should be available at all times. Below are some recent questions we've received regarding VetPlus Promax Syringe for Dogs & Cats, including answers from our team. I have given my 7 month old miniature dachshund one dose of the promax. She has come out in lumps on her body and is itching and scratching, could she be allergic to something in this? Allergic reactions to a probiotic such as Promax are not common. That said any dog can react in any way to any supplement or medication so it is possible. If she reacts the next time you give it then you can say with more certainty that she is allergic to the Promax. In which case I would suggest trying a different brand such as our own ReguTum. 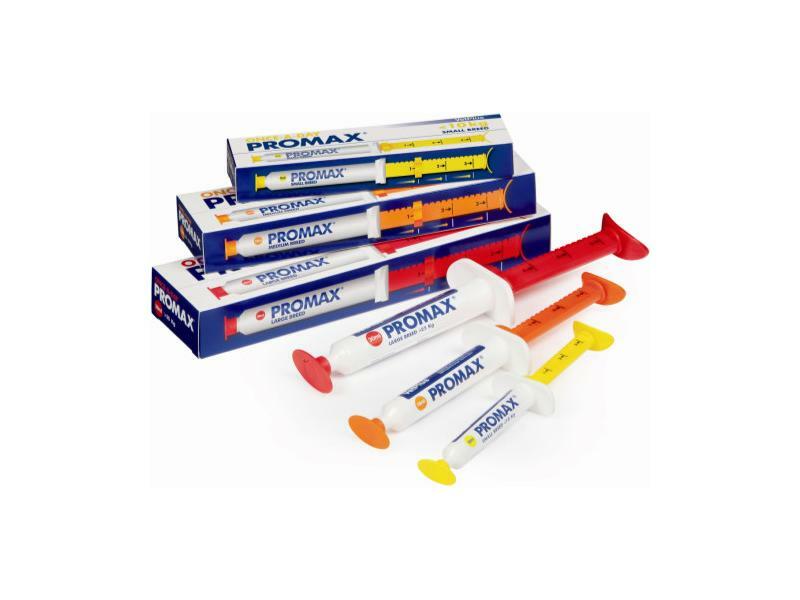 if cat take too long of the PROMAX, it is harmful for cat's health? 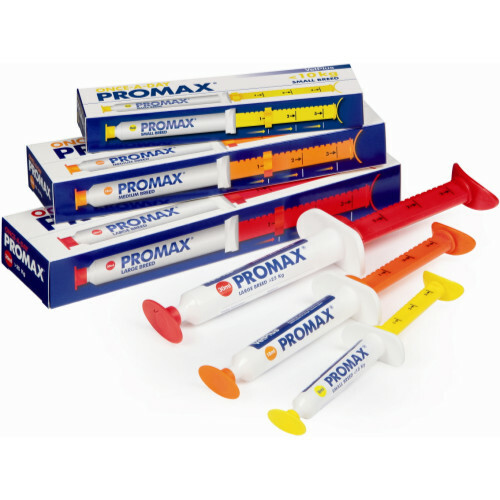 It is unlikely to be harmful to your cat to take Promax for longer than the specified 3 days course. However if your cats normal digestive functions have not returned within the 3 days it would be best to consult your vet. If you are looking for a long term probiotic you could try Protexin Pro-Kolin Enterogenic. Can this be given to 6week old pups who are still a bit sloppy from wormimg? This is fine to be given to puppies once they are weaned off their mother. Ideally give several small meals per day, but each meal should be a bit less than your puppies would choose to eat. The digestion settles much better if it is not overloaded with too much food, then your puppies will recover faster.